Fish and Veggies is having our first giveaway! 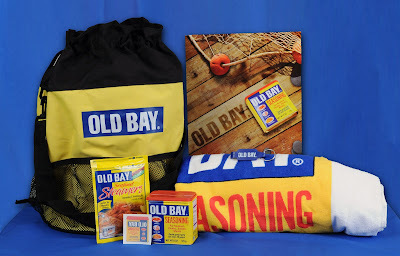 Old Bay Seasoning is celebrating their 70th anniversary and would like to give a Fish and Veggies reader one of the giftbags shown above. To enter the giveaway just leave a comment on this post before Sunday at 9 pm (CT). The winner will be announced Monday morning. Check out my favorite Old Bay recipes: Steamed Shrimp, Crab Cakes, Hollandaise Sauce ***Thank you for all the entries and kind words!!! After a random drawing, Dave is the winner of the Old Bay Seasoning give away. Congrats. Your gift bag will be coming in the mail.